The Burnt Store Isles and Burnt Store Marina area in southwest Florida are favorites among boaters and fishermen, and all those who simply enjoy a waterfront lifestyle. Burnt Store Isles is located on the coast of Charlotte Harbor in southwest Florida south of Punta Gorda and north of Fort Myers. In Burnt Store Isles and Burnt Store Marina are a variety of single family homes, condominiums and restricted-access communities. The community is built around a network of navigable canals, with access to Charlotte Harbor and the Gulf of Mexico via Alligator Creek. Burnt Store is one of the most popular and fastest-growing areas in southwest Florida. Located away from the hustle and bustle of the larger cities nearby, the Burnt Store area nevertheless offers a variety of choices for shopping, golfing, boating and other activities. Boating and fishing enthusiasts will love the full-service Burnt Store Marina, which offers 425 deep-water slips with direct access to Charlotte Harbor. 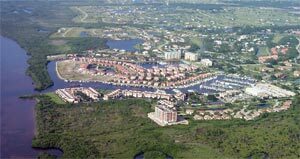 Golfers will find a superior course at the Burnt Store Marina and Country Club. With water on 16 holes and sand traps abounding, this beautiful course is among the best in Charlotte county.